Every business person must carry business cards to introduce himself to another professional as that carries his name, designation and company address along with other relevant contact details. Therefore, visiting card holders are ideal gift for every business executive as one must manage his visiting cards in a handy and presentable manner to leave a good impression on the recipients. The visiting card holders can be of pure leather, metal or mix of the metal and leatherette finish in various shapes and designs with space for your logo branding. The visiting card holder can be personalised with the etching of the name of the recipients to ensure that they prefer to use yours with them always. The latest addition to the range of visiting card holder is double sided elegant metal finish magnetic cover visiting card holder. Now exchange business cards without mixing them up. One pocket to store your cards and the another for the ones you receive. The dimensions are 93mm x 65 mm x 16 mm as per the image shown below. Another choice is double sided card holder with 2 tone leather finish which is not only stylish but easy to carry with compact design and magnetic cover. The branding space is available for laser engraving of your brand and logo. 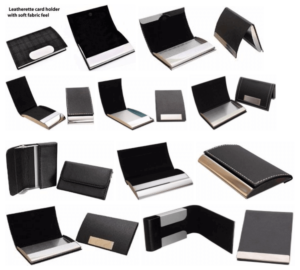 As the name suggest you have choice of leatherette visiting card holder in various shapes with or without metal at the top for branding space. The advantage is the soft cushioning feeling as there is no metal inside and ideal for keeping inside the handbag or backpacks. Leatherette card holder with soft fabric feel on metal in multiple designs to select from the best keeping your target audience and branding in mind. The images below show both the closed and open images to help you select the best for your free distribution to impress the recipients. Metal visiting card holders to carry the cards safely in a slim box with locking device to ensure that the same can be carried in pocket always. The cushioning can be arranged inside as required and is available both in gold and silver colours. There are several self-designs on the top surface to make it more appealing and one can select from the various attractive shapes and finish. There are times when you would like to give complete gift set instead of only visiting card holder with addition of either keychain or pen or both. Please refer to our business gift sets series for the complete gift set choices or write to us for more details. Leather wallet and visiting card holders are another attractive business gift set. We can also customised gift sets as per your requirement so please feel free to email us with your requirements.